Very rarely does a debut novel make a lasting impression upon the reader. Usually, the first novel is the author looking for their voice and haven’t mastered the delicate art of building up the suspense. 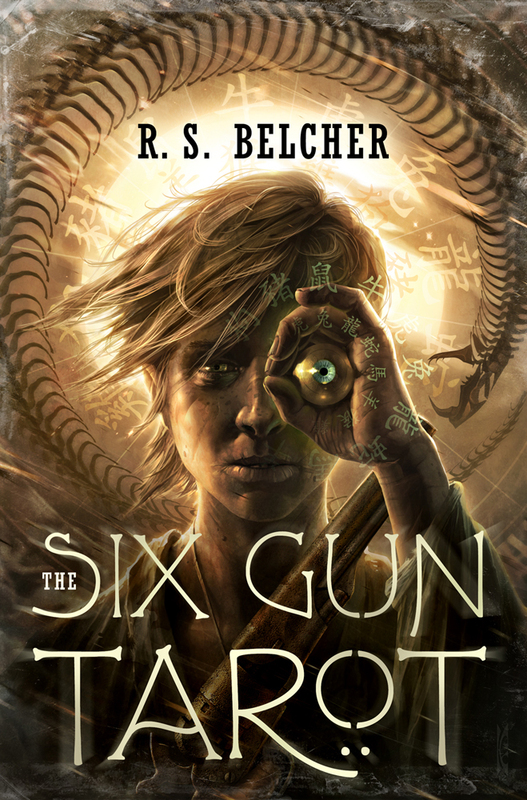 R. S. Belcher’s debut novel, The Six-Gun Tarot, destroys those preconceived notions. The book starts with the young Jim Negrey leading his horse Promise across a barren wasteland of desert in 1869. Near death and with little water, Jim is on the run from the law for a terrible crime. However, before the law can hang him, Jim has to survive the desert known as the 40-Mile. His hopes were to find a railroad job in a new city under a new name. But a shadow, something more than a crime he committed, lingers over the boy. Between dangerous animals stalking him and the desert, he is doubtful he will survive. Before the desert takes him, though, Jim is found by a strange Indian named Mutt and an even stranger man named Clay. The two men hail from the town of Golgotha, which is the closest town to where Jim wants to go. He accepts their ride into town when they are attacked by the coyotes which had been stalking Jim. Clay kills two, though the coyotes seem to be mildly nervous around Mutt. Jim is taken into town and, for the time being, will live another day. Or perhaps not. As he’s getting off the wagon, Mutt (who is the deputy sheriff in the town) gets a call for help. A deranged and drunken man has taken hostages inside the general store, and Mutt needs to stop him before he hurts anyone. He deputizes Jim, and they prepare to try and figure out how to stop the man from hurting anyone inside. Before they can do anything which might end up with some bodies, though, the town sheriff gets back to town. Jon defuses the situation with Mutt managing to save an innocent woman’s life, and the town settles down. Jim, uncertain what to do next, is officially deputized by Jon and taken to get some food and some rest. For the first time in a long time, Jim feels like he’s somewhere he belongs. Intertwined in the story about the crazy town of Golgotha is a deeper story about an angel who, while not exactly defying the Host, begins to doubt nonetheless. Because of this, he is tasked to stand guard over the sleeping darkness. Biqa, annoyed and angry, obeys, though it is evident that he is not happy with his punishment. After a time, though, his watch begins to take on a deeper meaning. Biqa begins to understand the little beings who exist around him, and begins to feel for humanity. This book… wow. Just wow. There is a blend of religion and folklore in the book that drags you in and makes the reader really think without lecturing. The pacing is fantastic (as evidenced by reading it, for the second time, in less that five hours) and the characters are all very well thought-out and believable. The setting of the town itself is magnificent, and seems to be a character all its own, a breath of life in what would normally be merely a static piece of scenery in any other work. The darker undercurrent of the book, which both drives the plot and lends a creepiness factor to some characters, is wonderfully done. The overall story arc is absolutely rock-solid. This book is a must-buy. I’d give this to someone asking me if I had read anything good and new lately. The author has done a tremendous job, and I for one can’t wait for the next round.